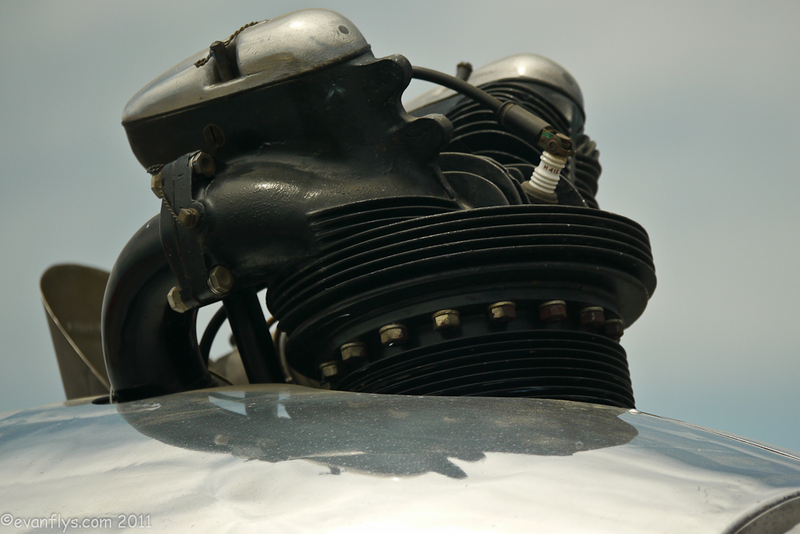 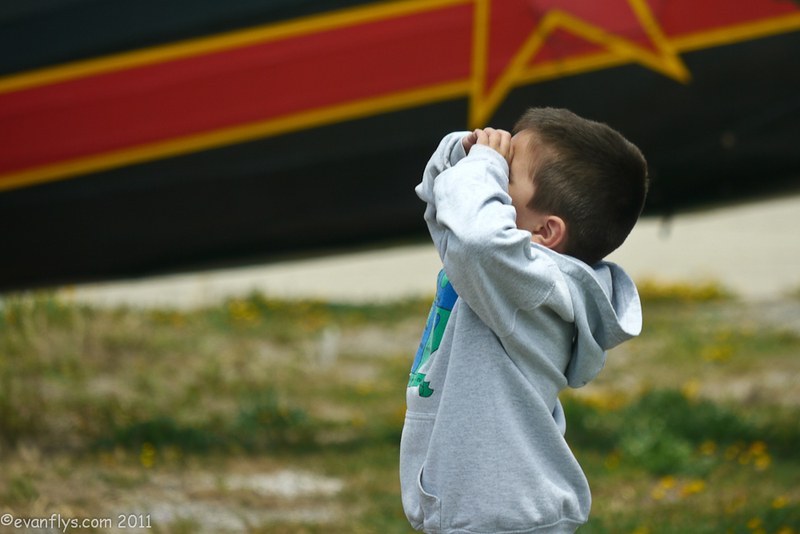 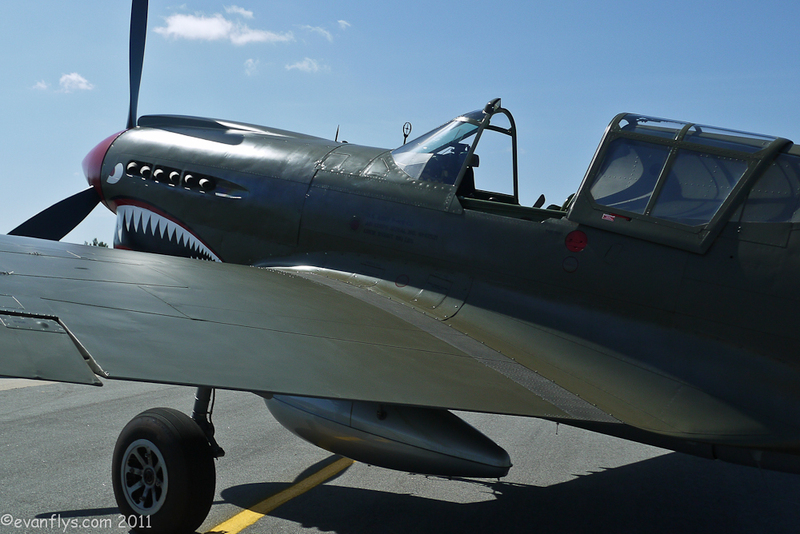 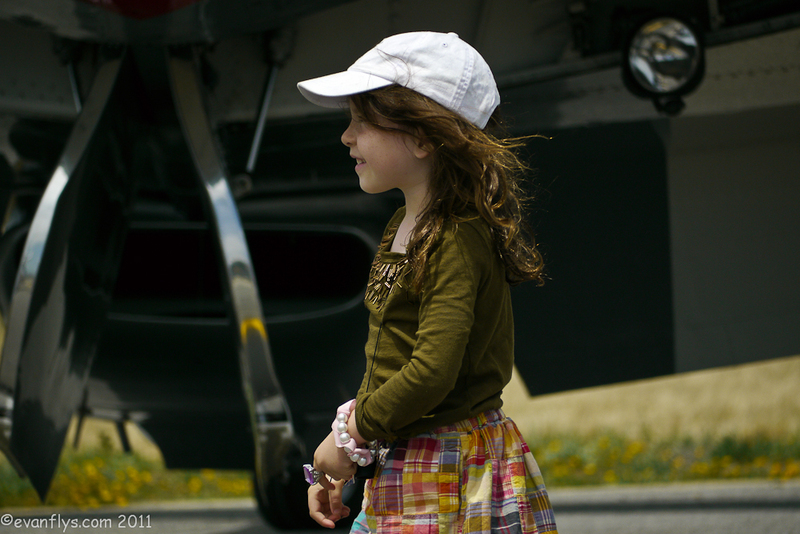 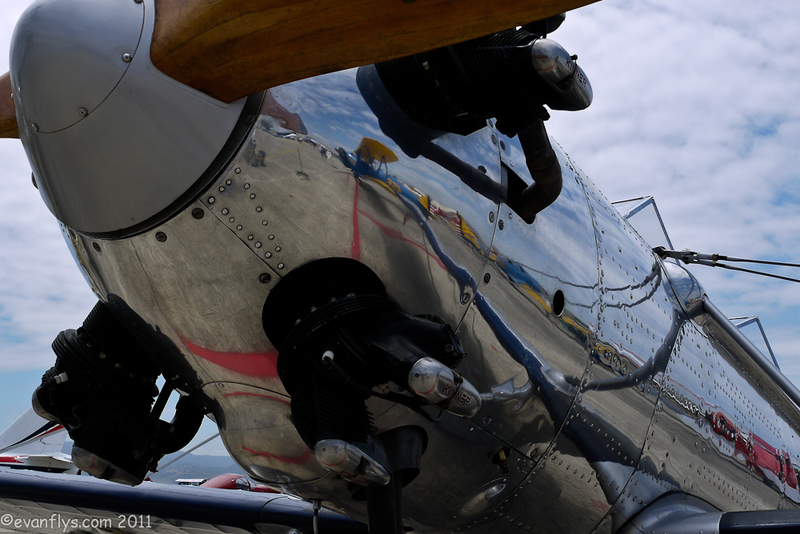 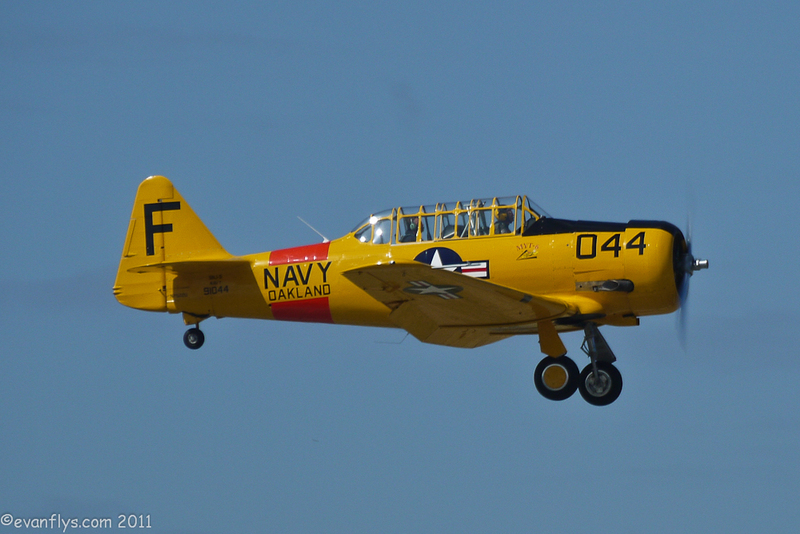 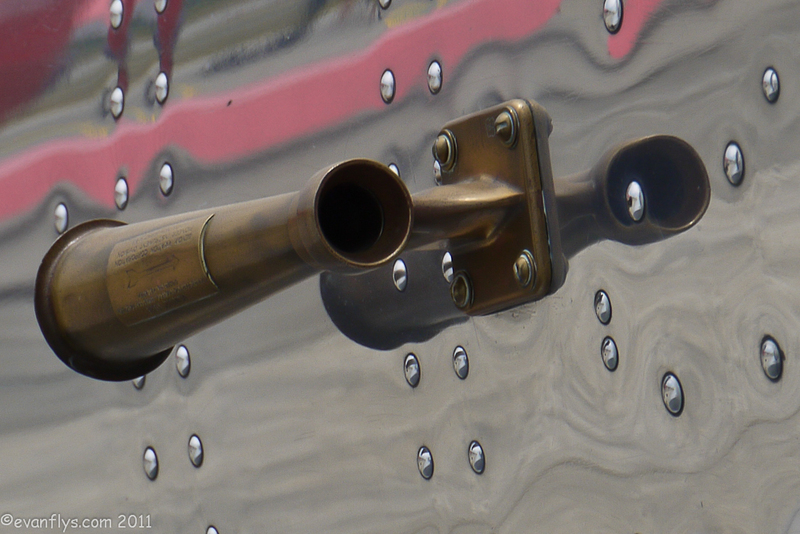 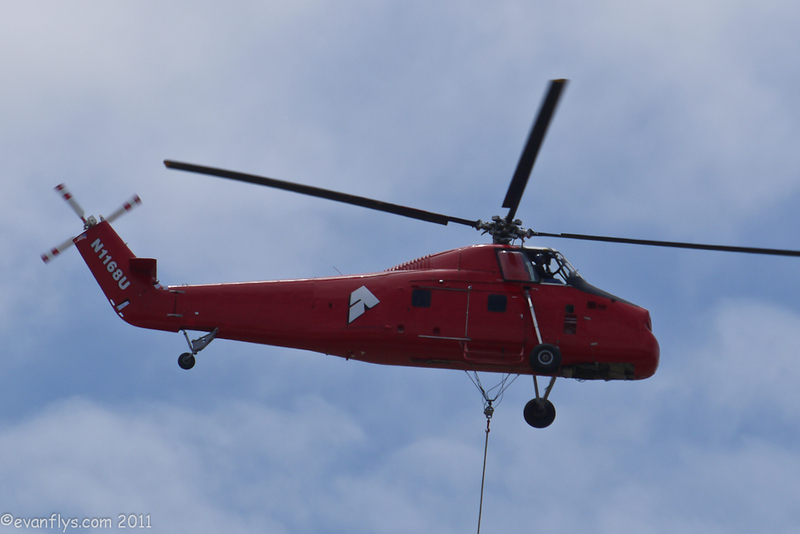 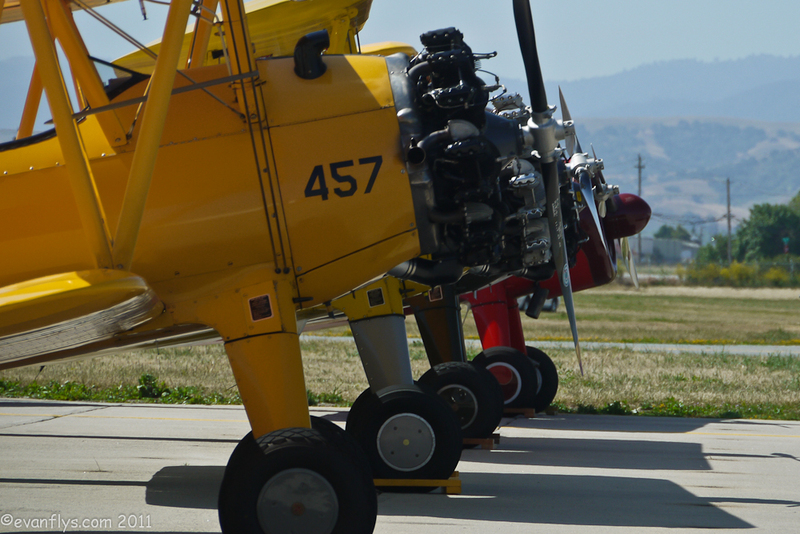 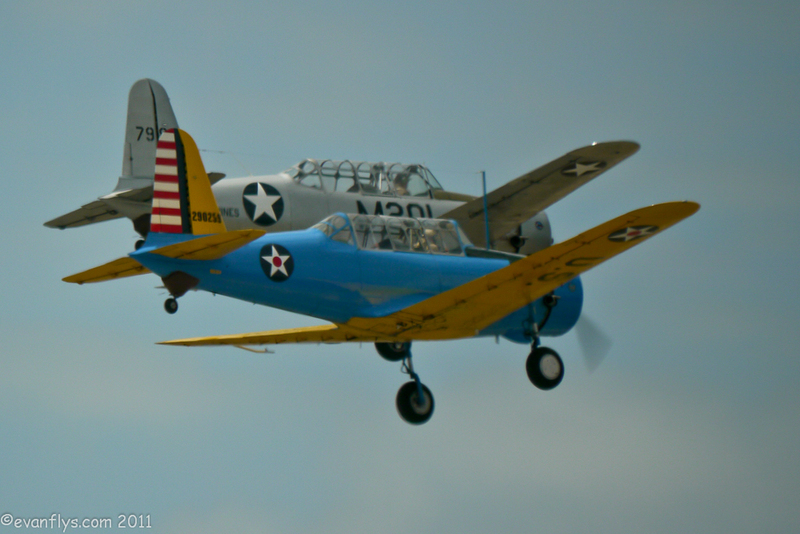 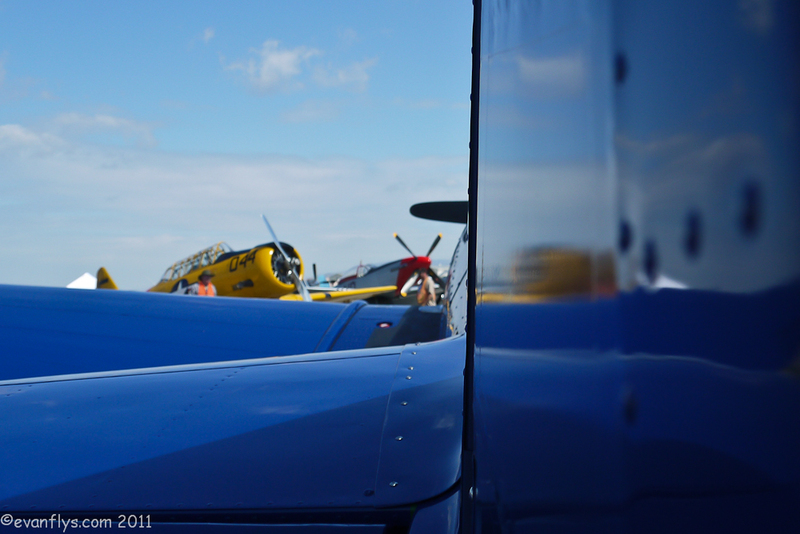 I loved the 2011 Hollister Airshow. 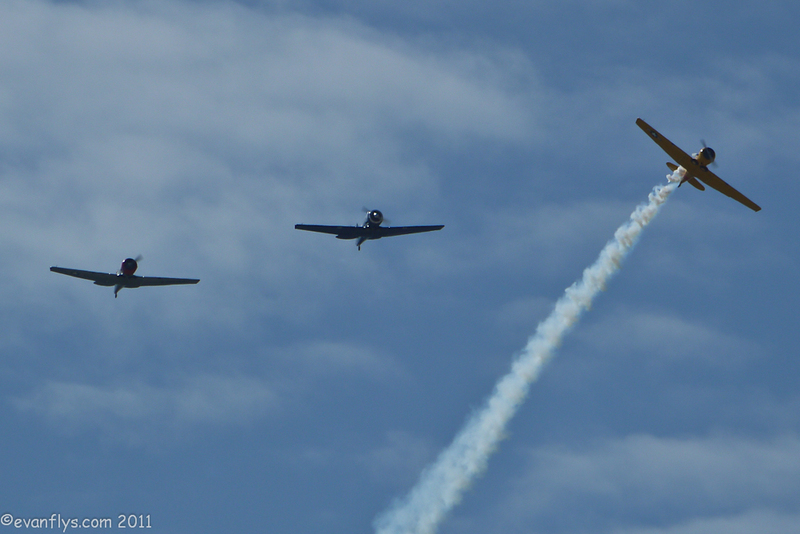 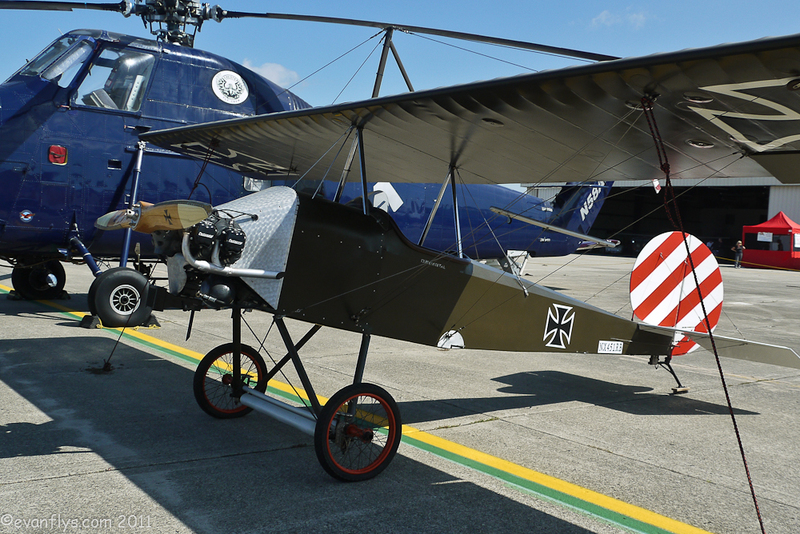 There were plenty of neat planes and performers, not to mention all the delicious food! 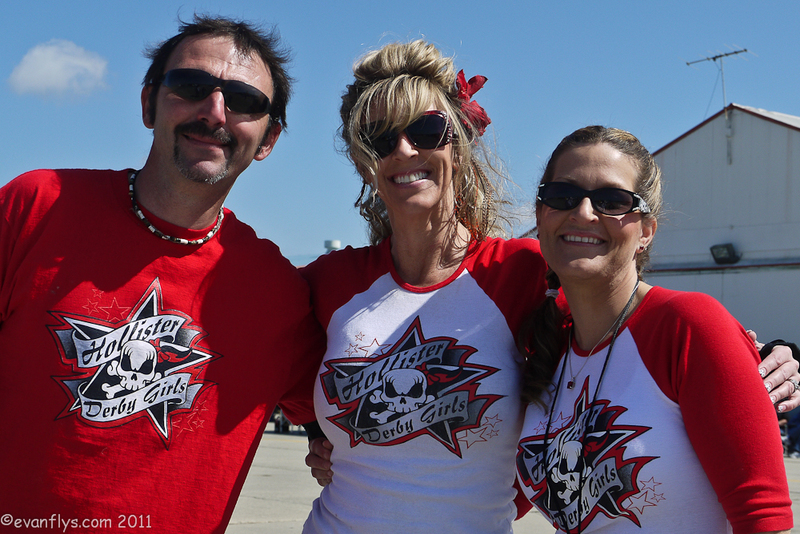 $2.00 corn dogs can't be beat! 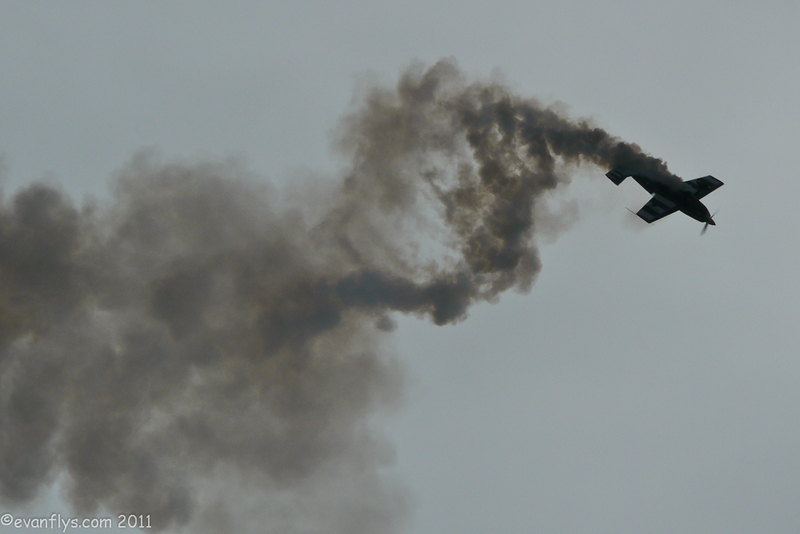 To kick it off, the L-39 American Spirit made passes over the crowd that definitely ignited the American spirit of everyone there! 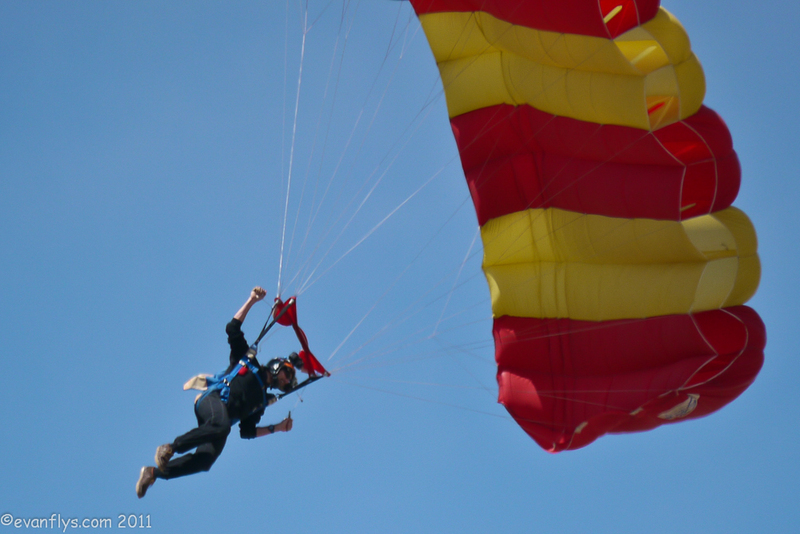 Next up was the flag jump with Tim Decker circling the jumpers while the national anthem was playing in the background. 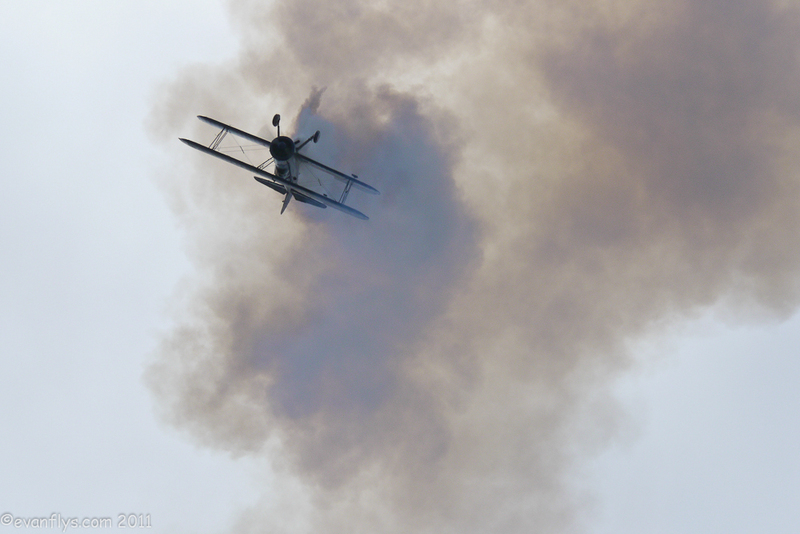 Tim then gave everyone a taste of the cool aerobatics to come in his Pitts S2B. 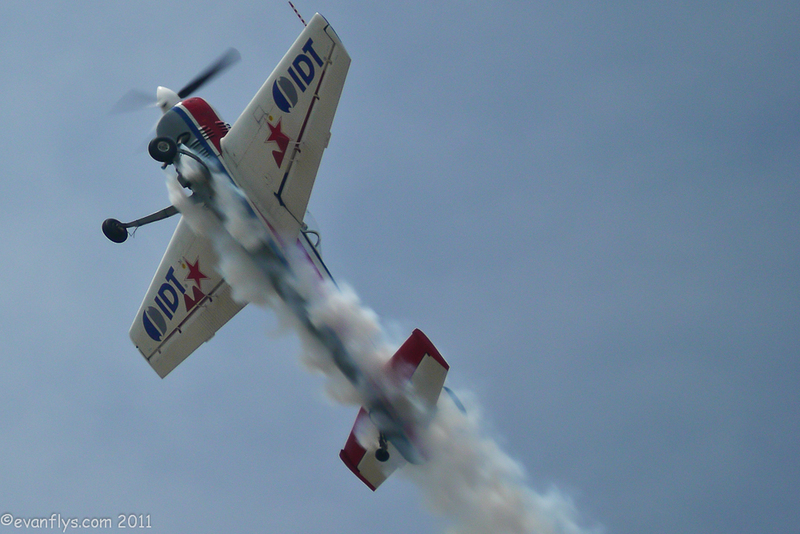 After him, Carl Liepold did a fantastic aerobatic performance in his beautiful and muscular YAK-55M. 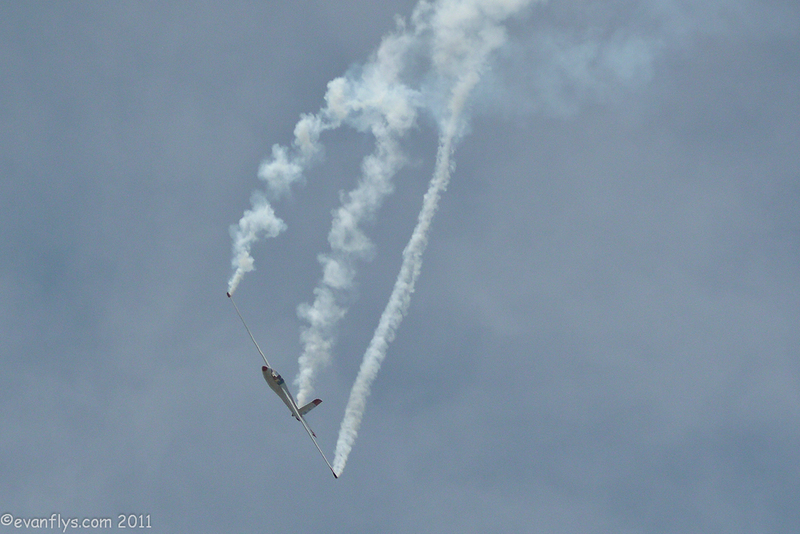 Next was Paul Jennings in his ultra-cool Swift S-1 aerobatic glider, which is the most aerobatic glider in the world. 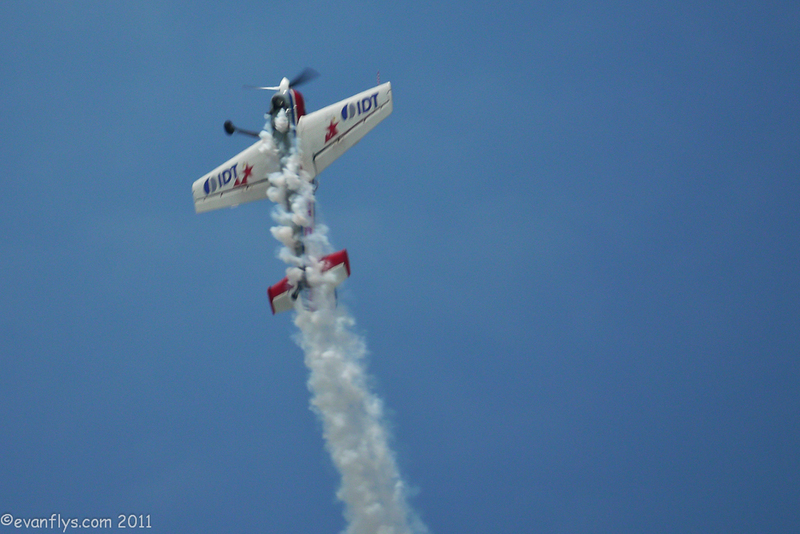 He did some incredible maneuvers like the jackknife, the whiplash and many other stunts. 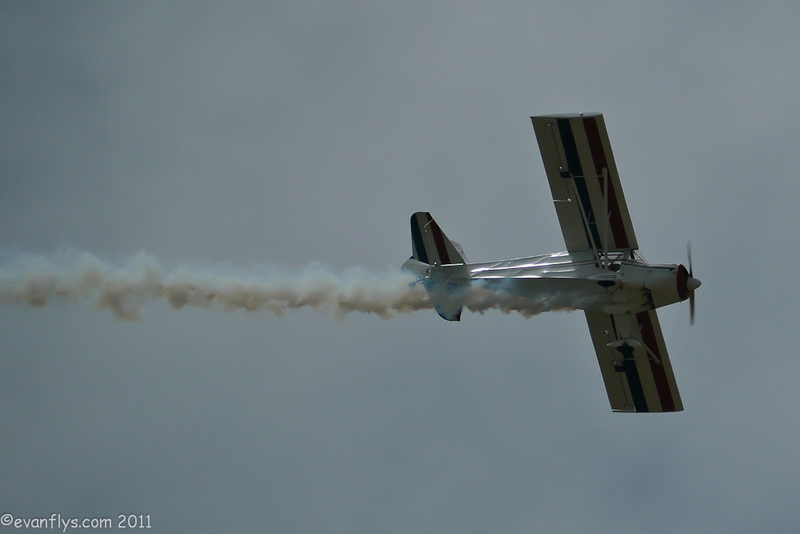 Next up was Dr. D, aka Frank Donnelly in his unique 1946 Taylorcraft, and he did some graceful old time aerobatics. 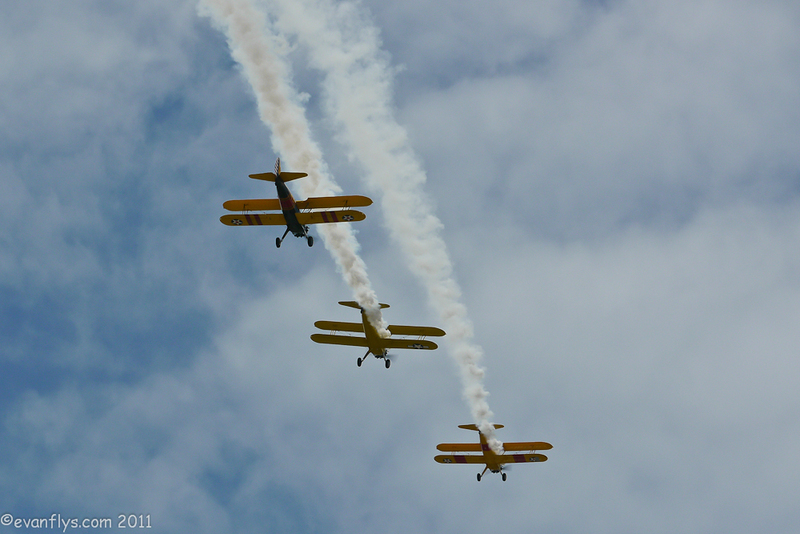 After him came the Stearman four-ship formation flyby, which included Vicky Benzing doing aerobatics in her shiny red 450 hp Stearman. 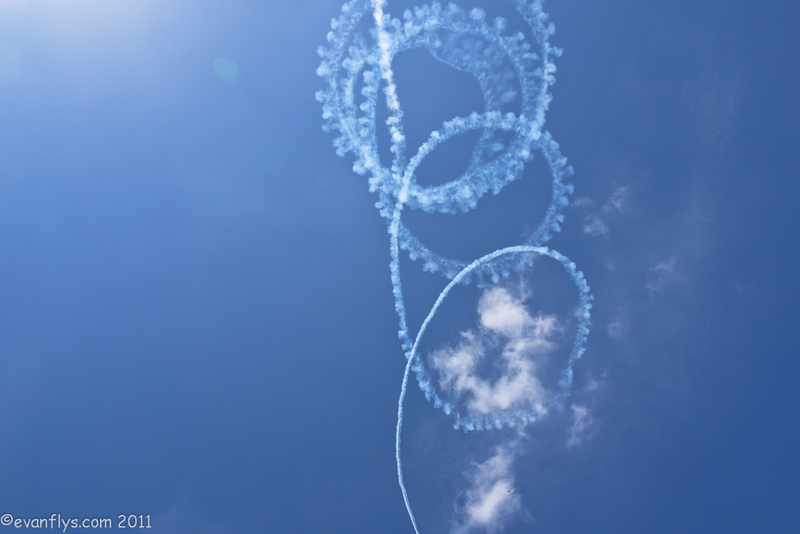 Now it was time for the fast crowd. 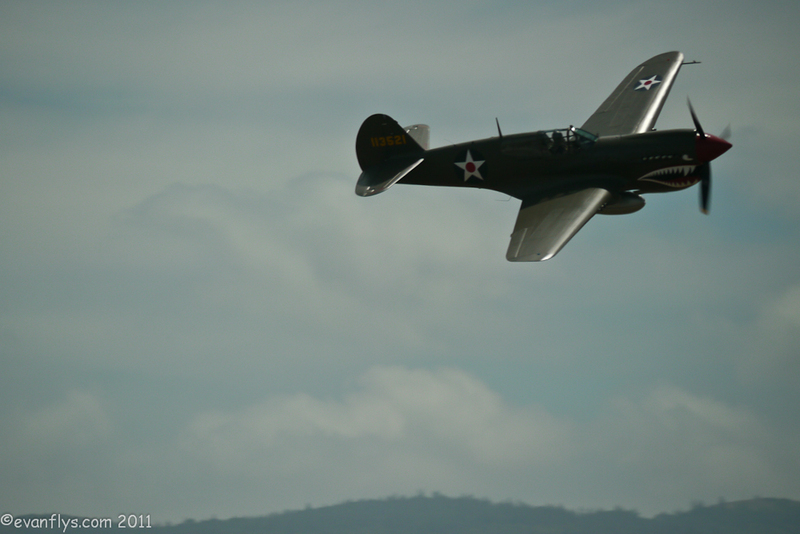 First Kevin Walker tore up the sky in his gorgeous white L-39, followed by a flock of T-6s, a pair of rare BT-13 Vultee Vibrators, and then the warbirds. 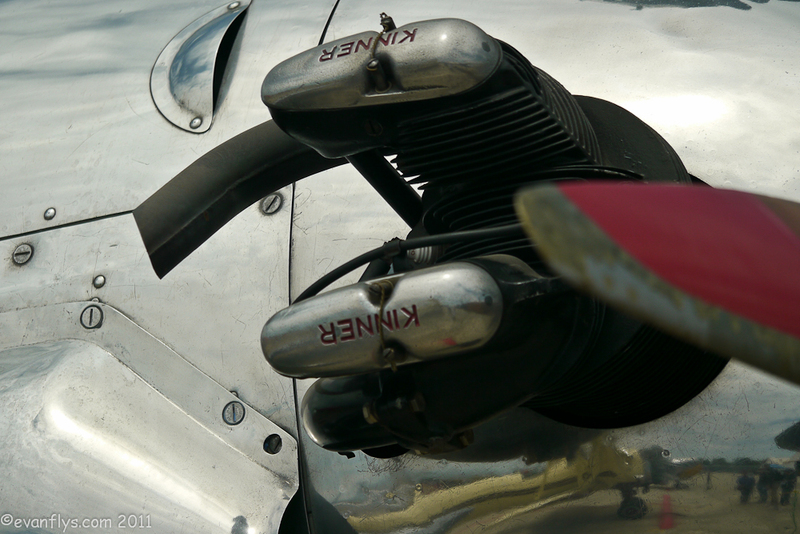 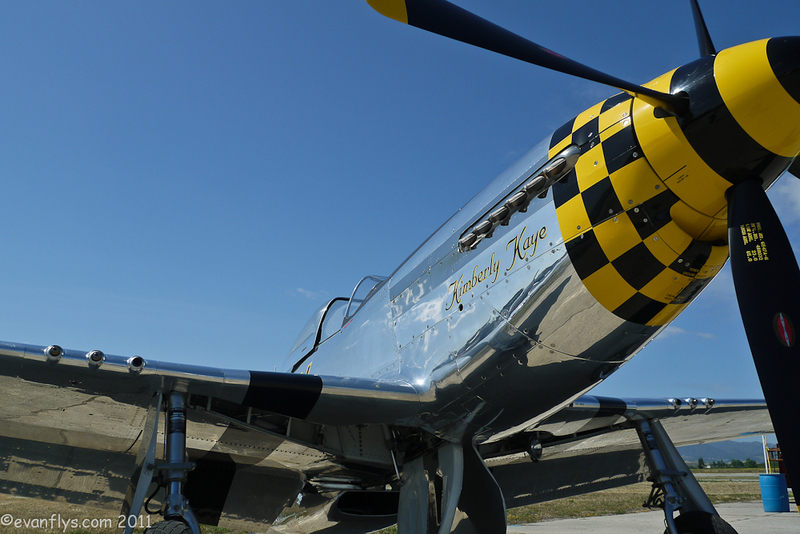 Warbirds included Tony Banta's stunningly polished Kimberly Kaye, Dan Martin's Reno unlimited air racer Ridge Runner III, an incredible P-40 Warhawk, a Yak 11 and a Yak 9. 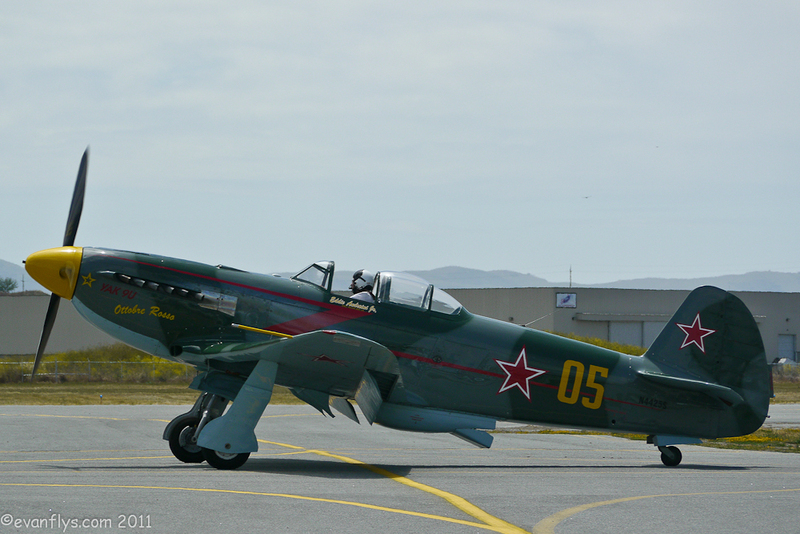 Eddie Andreini was next with an amazing WWII fighter aerobatic display with his incredible YAK-9U. 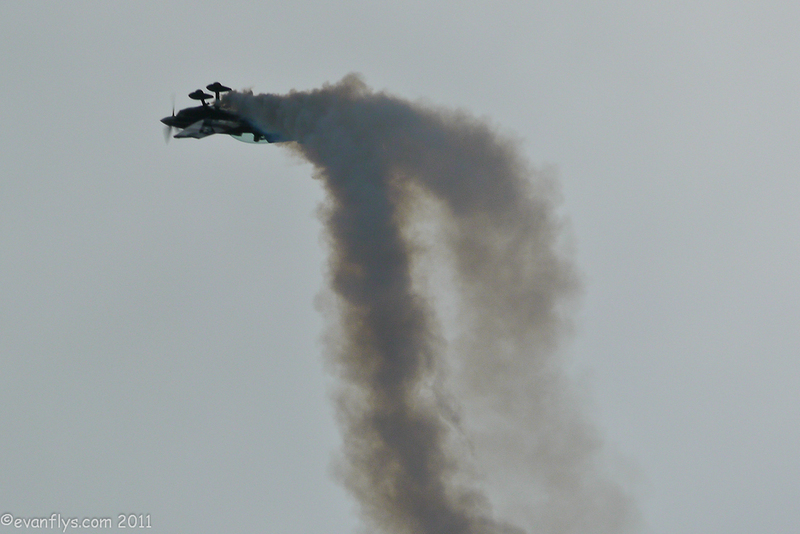 That really heated up the sky and we were ready for some serious aerobatics now. 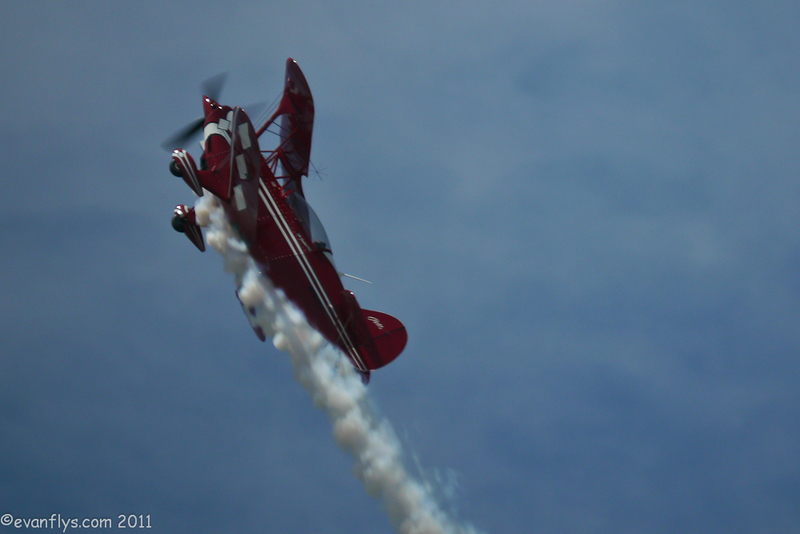 Vicky Benzing amazed the crowd with her Extra 300S and how she could throw the plane across the sky. 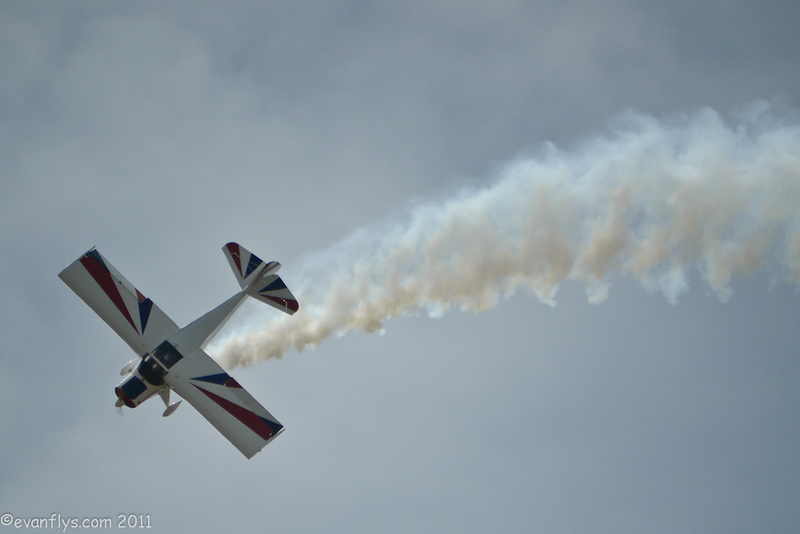 That was a hard act to follow, but Tim Decker was certainly up to the task, and he really showed the crowd some Aerobatics with Attitude! 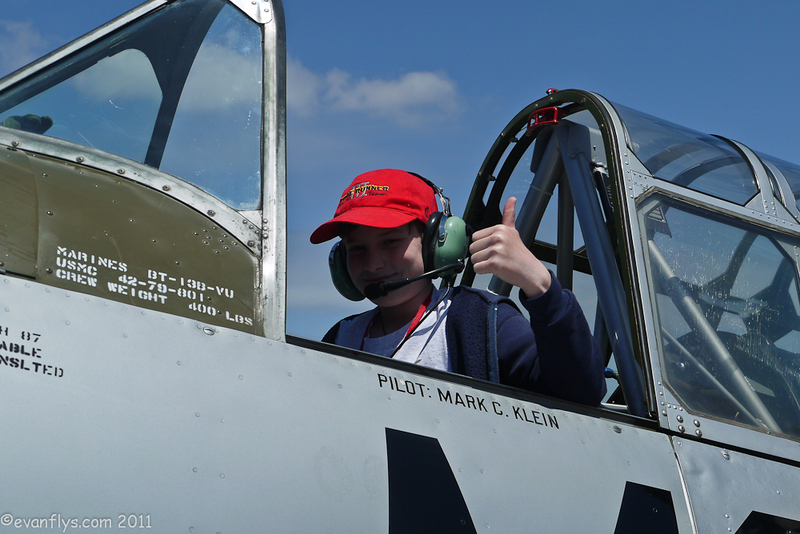 Finally, it was Eddie's turn again. 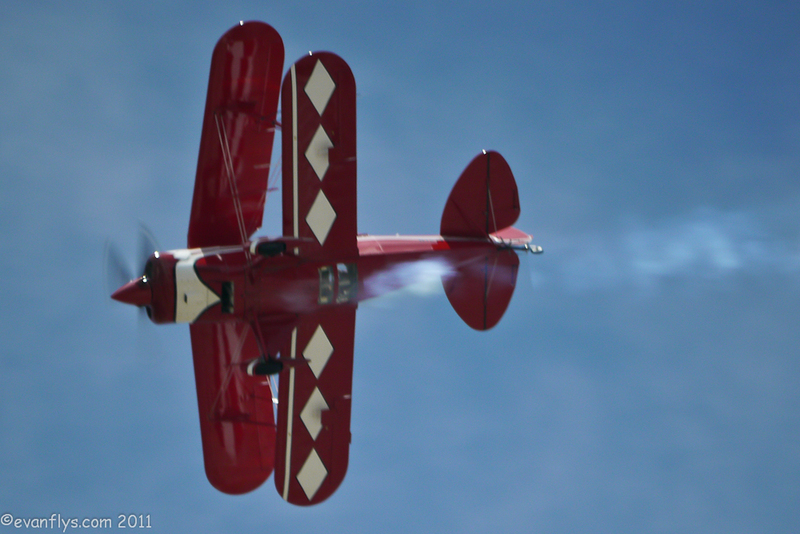 He defied gravity in his spectacularly tremendous Super Stearman! 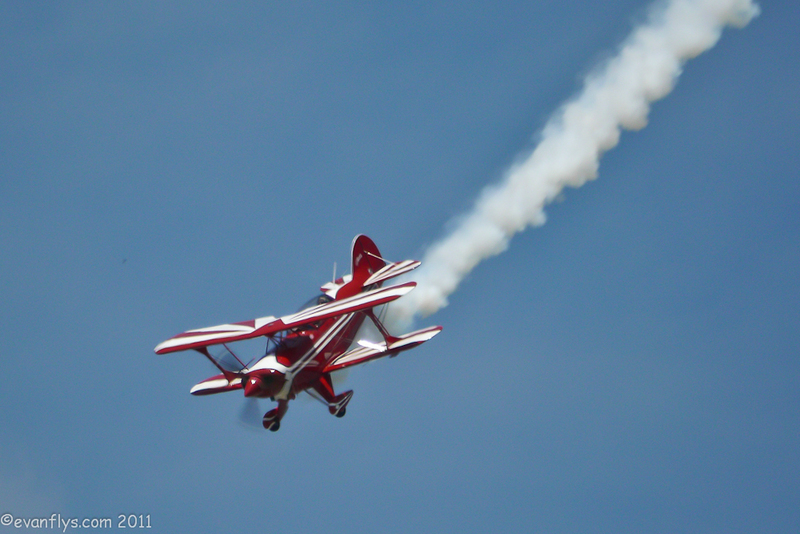 He made the crowd gasp, and then a sigh of relief after his specialty move, the lomcevok. 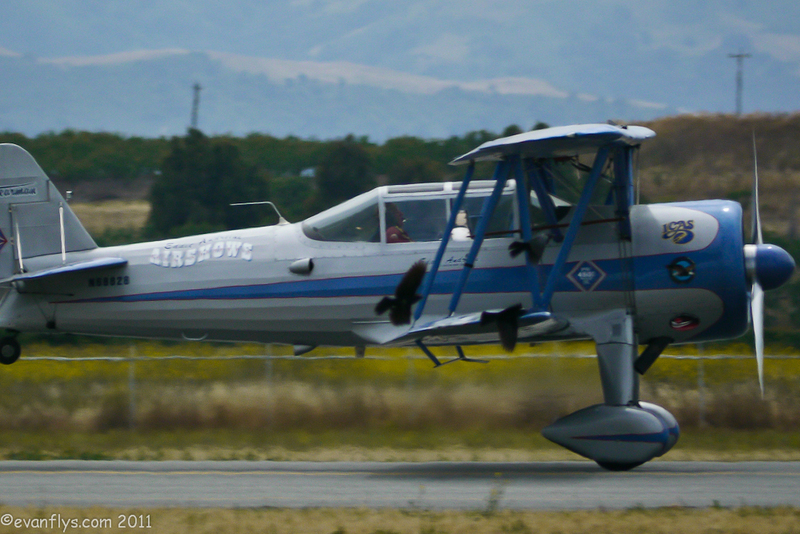 I don't know how to describe a lomcevok except that Eddie flies backwards while going sideways. 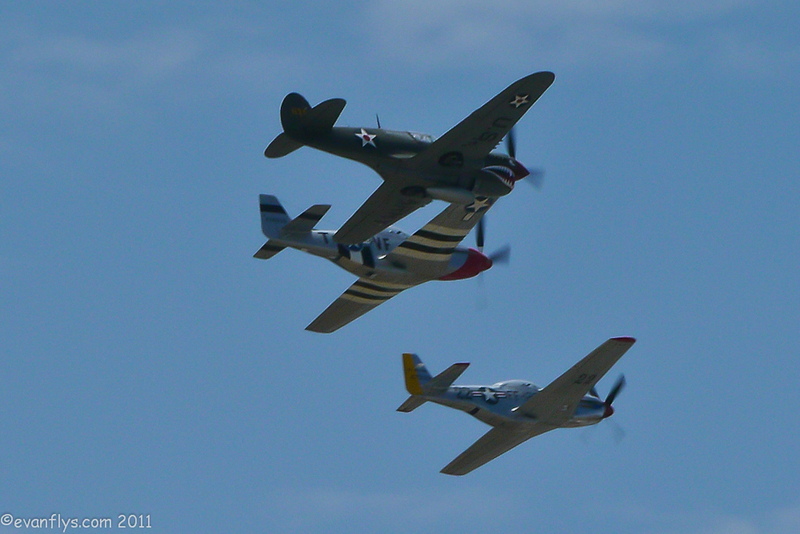 Anyway, the 2011 Hollister airshow was a great show. 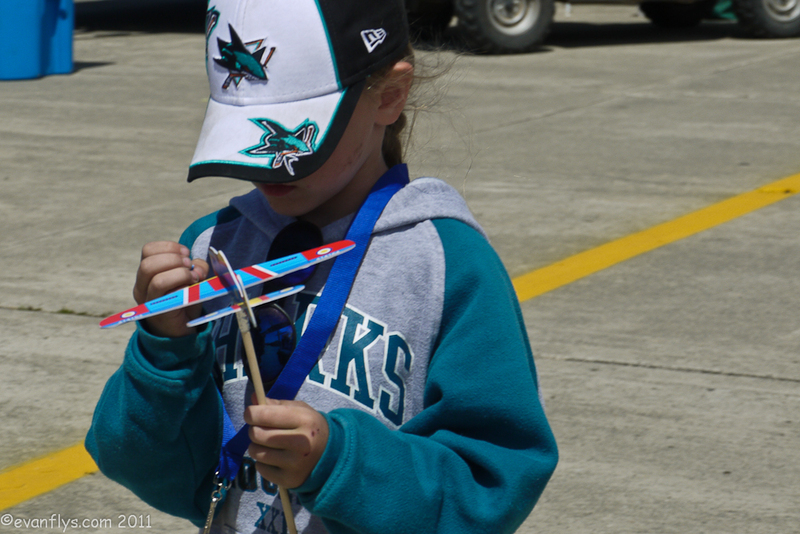 The aerobatic glider performance and the security provided by the Hollister Roller Derby girls were my dad's favorites.﻿ I liked the corn dogs! 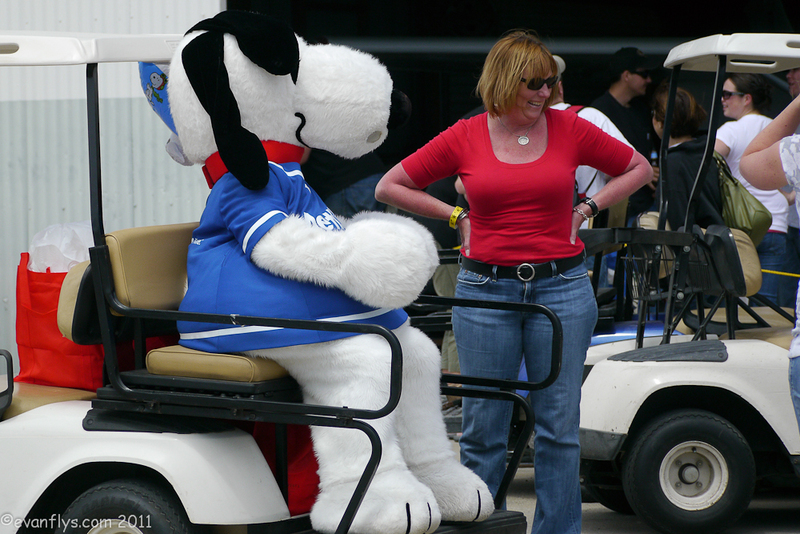 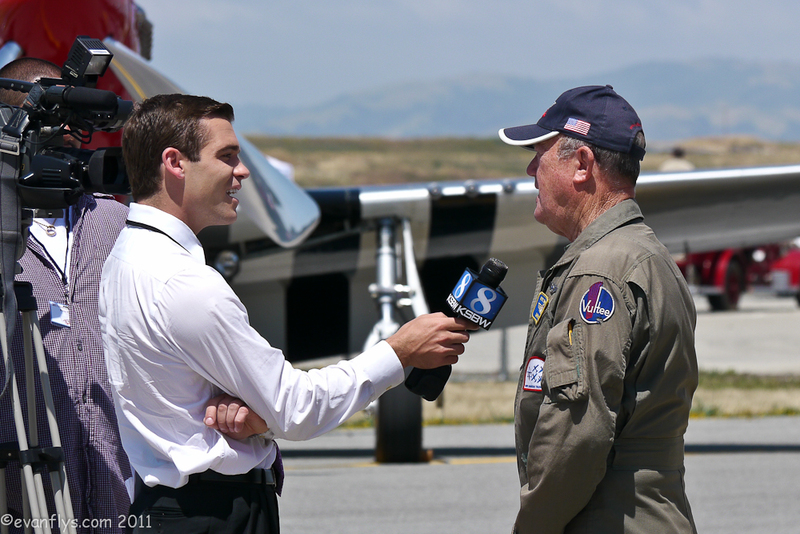 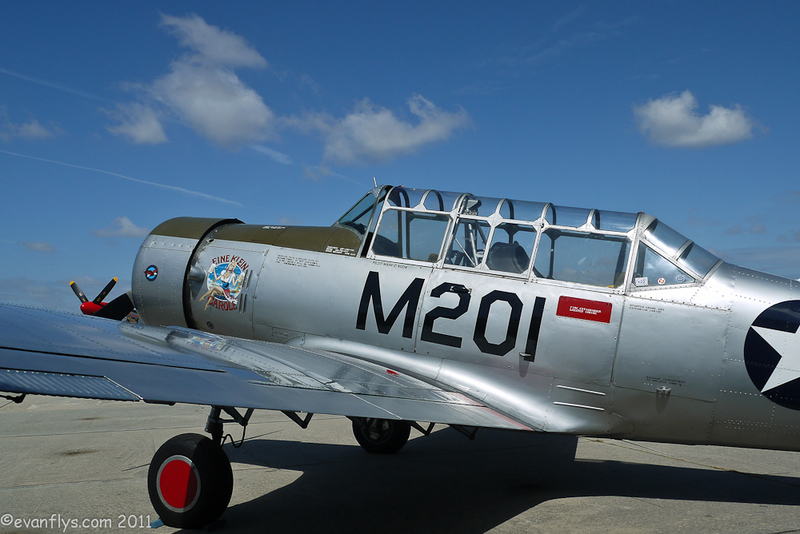 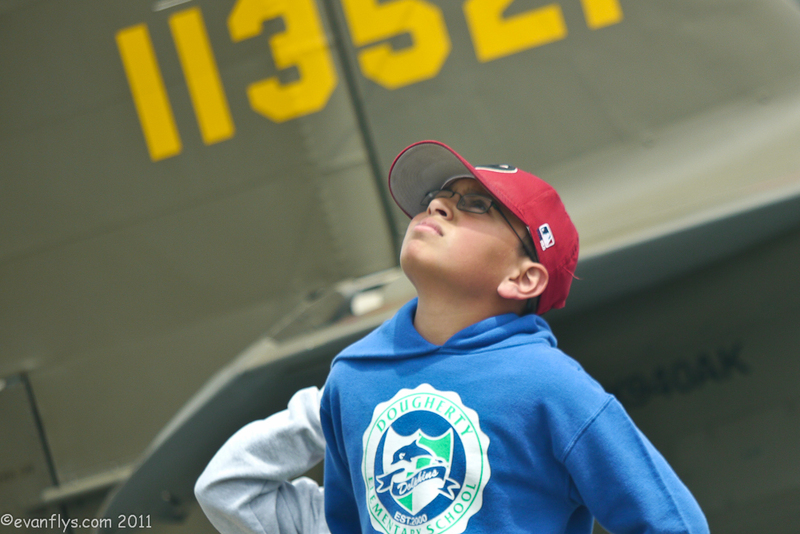 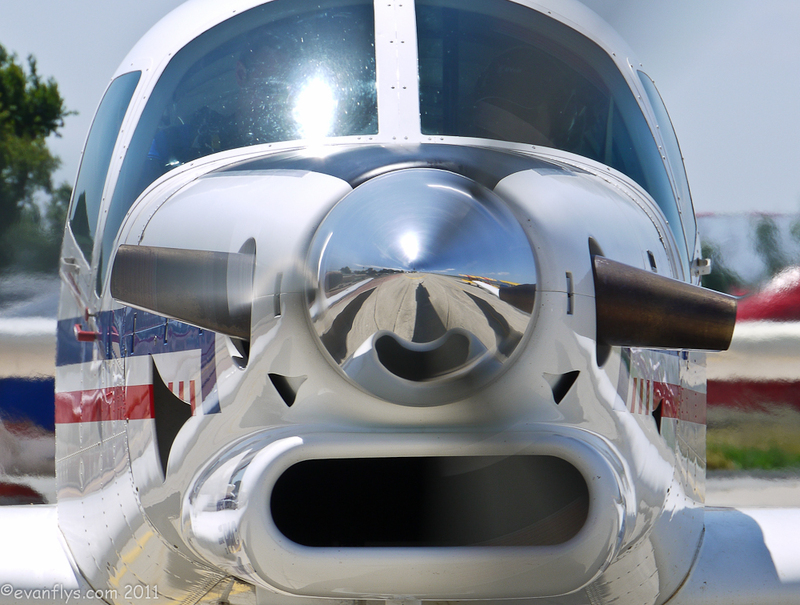 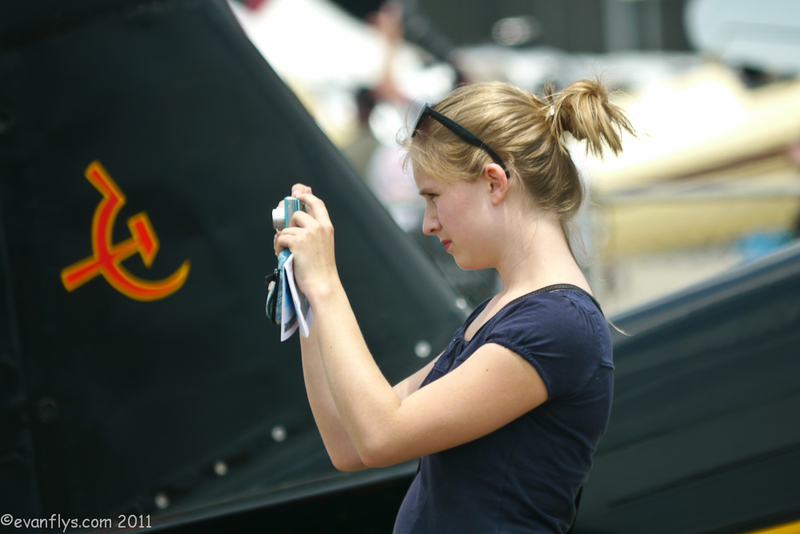 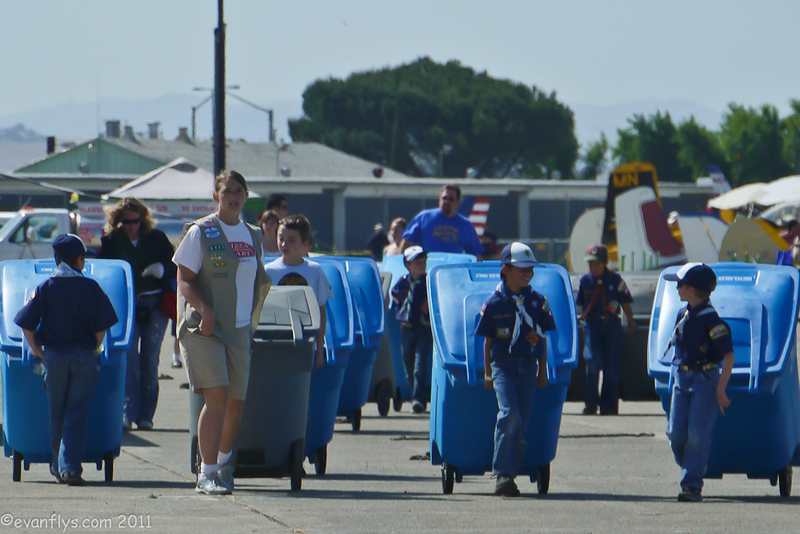 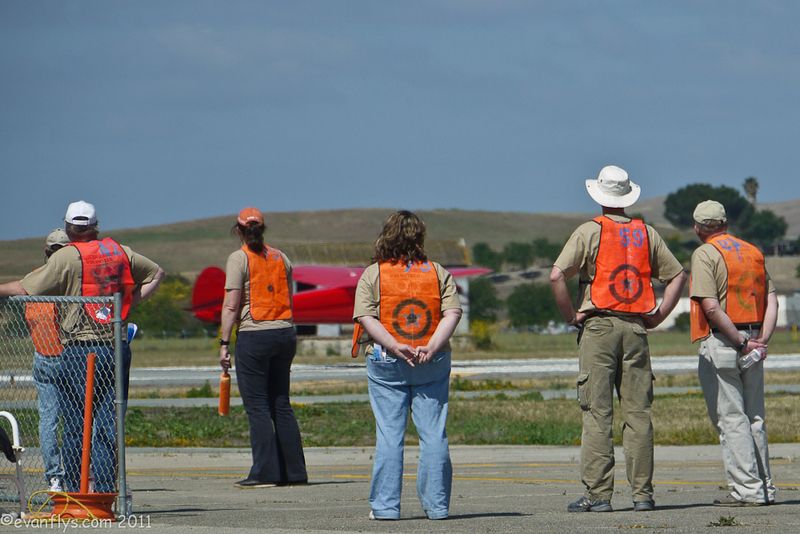 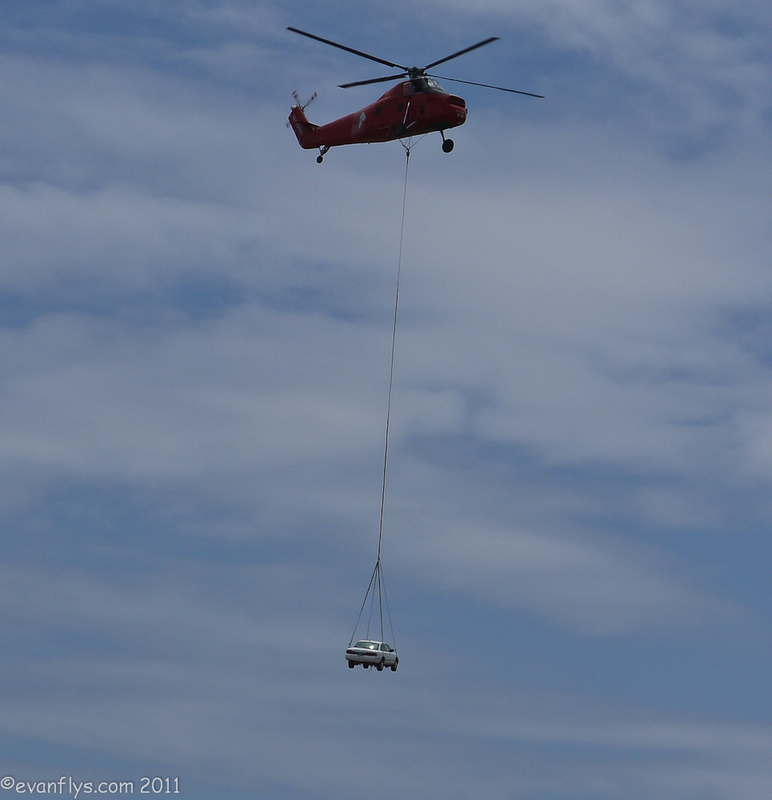 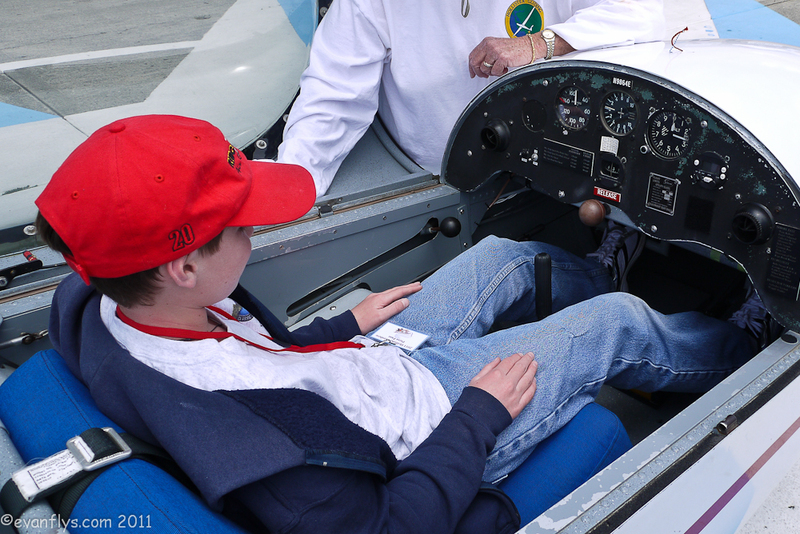 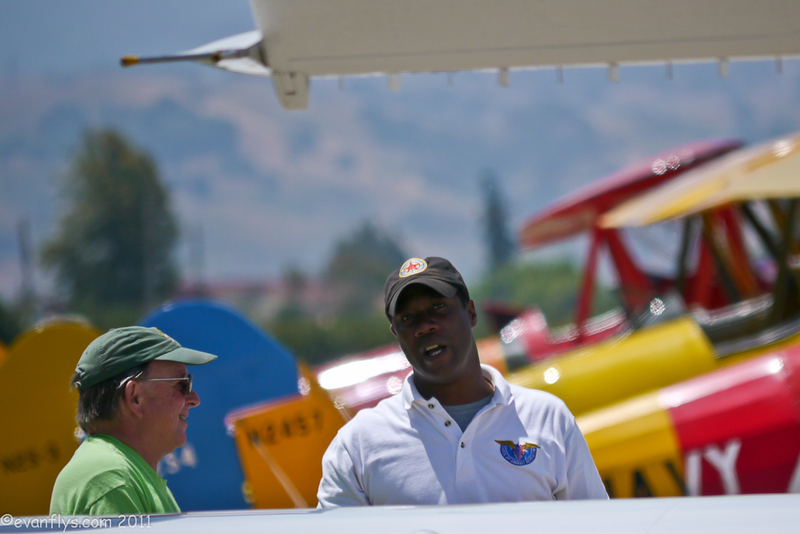 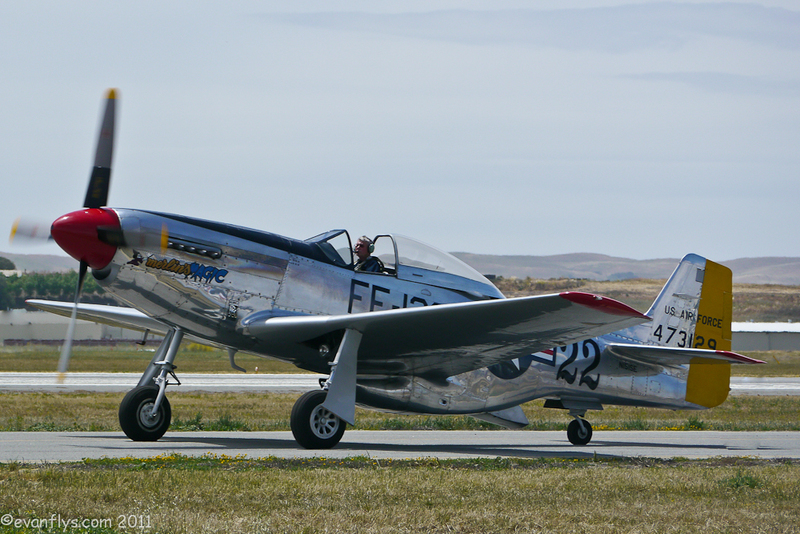 Well, I hope to see you next year at the 2012 Hollister Airshow!